The resort's massive pool area has space for everyone. Wade over to the pool bar and order a refreshing drink. Enjoy a special meal at 21 Main Prime Steak House. Bright interiors and comfy couches are great for families. The resort look out over the Atlantic ocean. Enjoy a relaxing swim in the indoor pool or float along the indoor lazy river. There's a swim-up pool bar where you can enjoy drinks in the water. North Beach Plantation resort is located in Briarcliffe Acres and offers convenient beach access. Stop by your condo rental to drop off your luggage before heading to the pools. Don’t worry about unpacking; there will be plenty of time for that later. Get changed into swimsuits, grab pool toys and goggles and slap on some sunscreen. North Beach Plantation offers several water amenities: 5 Pools, Indoor Lazy River and a Children's Pool. You won’t even have to leave the pool to enjoy a refreshing drink – there’s a swim-up pool bar. Or relax with that book you’ve been meaning to finish on the pool deck with loungers. Treat yourself to a soothing massage at the on-site spa, Cinzia. Head to the fitness center for some exercise or take a Pilates class offered at the resort. For a bite to eat, the resort has an on-site steakhouse/sushi bar, 21 Main, which serves gourmet dry-aged steak and fresh sashimi. One- to five-bedroom condos sleep four to fourteen guests and are all individually decorated units. Full kitchens because sometimes a mini-fridge just doesn’t cut it. Stop by the Super Bi-Lo for groceries – the kitchen won’t stock itself. Ask the kids to help make your famous chocolate-chip cookies (not that they’ll need convincing). The in-suite washer/dryer will come in handy if the flour or eggs decide to go rogue. Air conditioned units will be a welcome break from the heat. You don’t have to worry about missing this week’s episode of Survivor; you’ll have Flatscreen TVs. The resort has daily housekeeping, so you’re off the hook in that department. 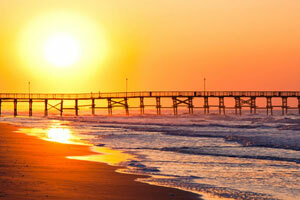 Take advantage of the free area shuttle to explore the best attractions in Myrtle Beach. Broadway at the Beach features a variety of shops and restaurants. Get a new pair of shades at Sunglass Hut. Let the little ones create their own stuffed animal at Build-a-Bear. Design and create a unique pair of flip flops at the Flip Flop Factory. Hungry? Johnny Rockets, Hard Rock Cafe and Joe’s Crab Shack are just a few of the dining options available. Treat the kids with a visit to The Children’s Museum of South Carolina. It has several interactive exhibits that are both fun and educational (but don’t tell the kids that!). One of the area’s best attractions is the SkyWheel. It’s almost 200 feet tall, with incredible views. Plus, it’s a ride that everyone in the family can go on together. - Front desk is located at 718 48th Avenue South, North Myrtle Beach, SC 29582. It is open 9:00 AM-10:00 PM daily. Guests that are planning to arrive after normal front desk hours can check in with security located in the lobby. Minimum Spring Break check-in age is 25 years old. The name on the credit card used at check-in to pay for incidentals must be the primary name on the guestroom reservation. Please also note that motorcycles are not allowed at this property.